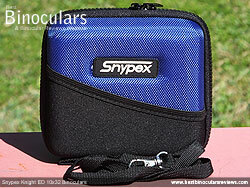 Snypex Knight ED binoculars are available in three main sizes, the "normal" full sized 42mm versions that are ideal for most uses, the slightly oversized 50mm models where light gathering is of paramount importance and then there are these 32mm mid sized bins where portability (a small size and low weight) is important, but you still want a reasonable amount of light gathering potential for a decent low light performance. Full compacts that usually have objectives of 28mm or less, may be smaller and lighter than a mid sized bin like these, but you pay for this by reducing the light gathering ability and therefore also sacrifice the image brightness, especially in poorer light conditions. Please Note: Because I have also already written reviews on the Snypex 8x42 Knight ED and the 10x50 Knight ED, that use many of the same coatings and components, I will refer to these reviews in these instances rather than just repeating myself and keep the focus on the unique aspects of this mode to this review. 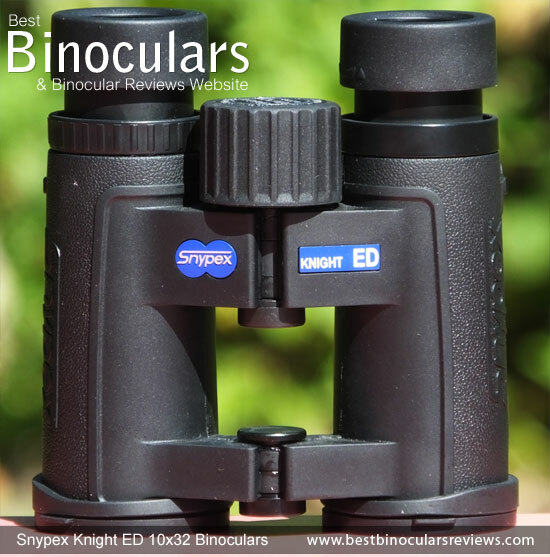 Whilst as I have already mentioned, they have smaller objective lenses than both the 42mm and 50mm Knight ED's these Snypex Knight 10x32 ED binoculars still have the same overall straight through body shape common to most roof prism binoculars and still also have an open bridge body covered in a rubber armour. So to discover more about the benefits of this open bridge body shape and how the rubber armour covering brings a number of benefits beyond just protection, you can read the body section of the 8x42 Knight ED Review here. One area where these 10x32 Knight ED's do differ to the others is that even though the objectives are smaller, they are even more deeply set within the ends of the barrels. I measured the distance from the ends of the barrels to them as being 8mm, which for a bin of this size is really deep. 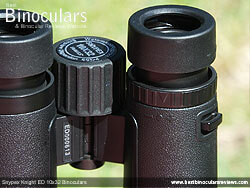 This overhang will offer more protection to the lenses from light rain and keep them cleaner for longer as less dust will get to them It also protects them from being scratched and can act like a sun shade that photographers often use on their cameras to prevent glare or flaring in certain bright sunlight conditions. Like their bigger brothers, these are also tripod adaptable. What I mean by this is the dust cap on the front bridge can be removed by unscrewing it. This thread is a standard size that will accept most tripod adapters, making it really simple to attach these to a tripod. This can be useful for those who want the steadiest view possible or if you want to keep your bins trained in the same direction over long periods of time, for example if you are in a hide or as I have found out some artists who want to keep returning to the same view over and over again. Snypex Optics advertise that this model has a Polycarbonate body and I think that some parts are also made from Aluminium. Whilst polycarbonate bodies are lightweight and cheaper to make, they are not as robust as magnesium ones. As with all other Knight ED models, this 10x32 version is fully sealed and then filled with nitrogen gas, ensuring that they are not only waterproof but fog proof as well. Many mid sized and compact bins have simple folding rubber eyecups, that can work well, but are less customizable and often less durable than the good quality twist-up eyecups, like the ones found on these. I say good quality because the housing on these is made from metal, which is far stronger than the cheaper plastic ones that are often used, which considering that this is an area of a bin that gets damaged most often is really important. They have a rubber coating over this metal housing which helps make them sit more comfortably against your face. The cups have an external diameter of 35mm, which is smaller than most full sized bins, but on a par with most mid sized instruments. The actual twist up and down mechanism felt really smooth on my test pair and they had no free play at all. 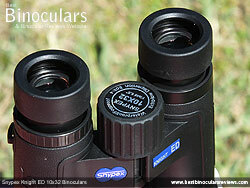 The have three click stops (fully retracted, mid way and fully extended), which combined with an eye-relief of 17.5mm means that most people, even those who wear glasses should have enough scope to be able to adjust them to ensure you get a full view without any dark rings or spots on the edges. As most of the body and it's parts are made from either magnesium or a metal, I was somewhat surprised to discover that the focus wheel is made from plastic. However whilst it may not be quite as robust or as luxurious as a metal one, I found that it turned nice and smoothly, without any free play or sticky sections. The wheel itself has a diameter of 31mm, which is quite large for a mid sized bin, indeed it is bigger than that on some full sized bins that I have used, which makes it nice and easy to reach. This along with the grooved rubber coating and the smooth action makes it easy to reach and turn even whilst wearing thickly padded winter gloves. It takes about 1¼ turns (450°) of the wheel on the Snypex 10x32 Knight ED to take the focus from near to far (or vise versa). This is a comparatively quick focusing gear, which means adjusting it over larger distances is nice and quick, but in theory also makes it just a tad more difficult to fine tune the focus. However I never had an issue with this and never found it a problem to get a perfectly sharp image. 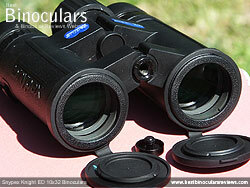 As with the vast majority, the diopter adjustment is made by turning the wheel located near the the right eyepiece. 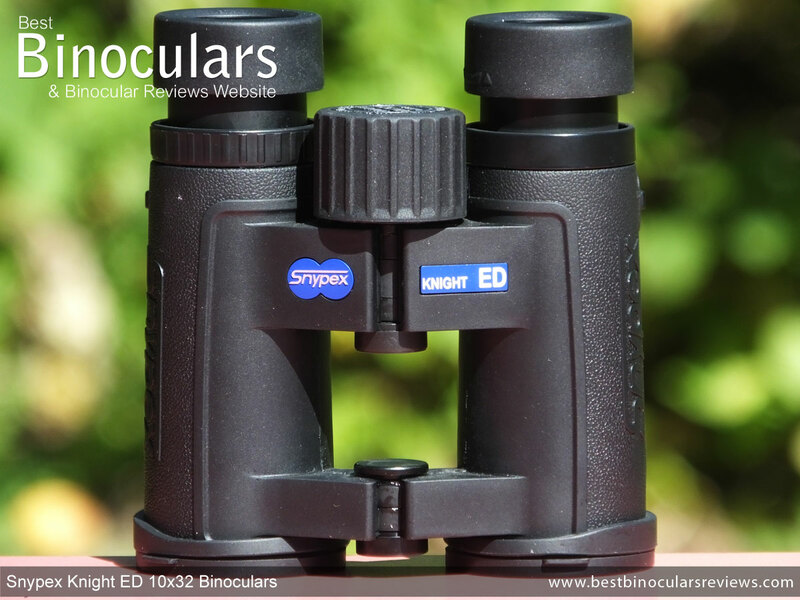 This adjustment alters the focus of the right hand side, independently of the left, thus calibrating your binoculars to make up for any differences in your eyesight between your left and right eyes. On the 10x32 Knight ED that I was testing, it turned with just enough friction so as not to make it too difficult to move, but along with some fine click stops, just enough, so that it should not easily move by accident. A locking mechanism would be even better and I would also like to have seen more markings or a scale, which would make it easier to remember and return it to a desired setting if it does get moved. 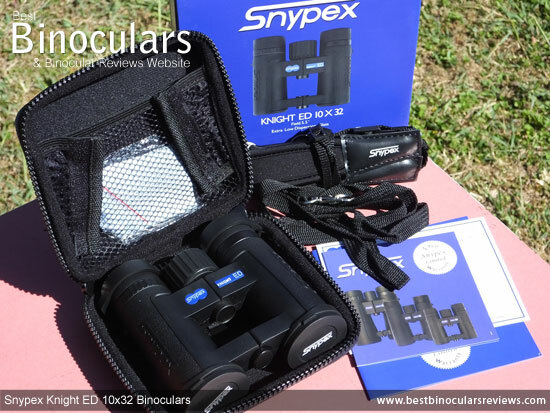 As you can see from the table below, the weight of these Snypex 32mm binoculars t is half the weight than that of the 8x42 Snypex Knight ED, which is substantial. 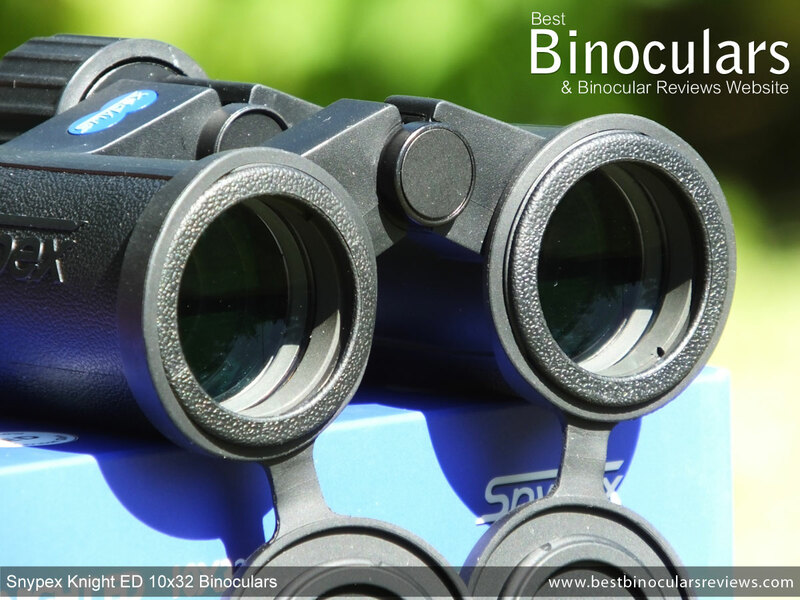 However what is also very impressive is that they are lighter than just about every other good quality mid sized binocular I have tested. 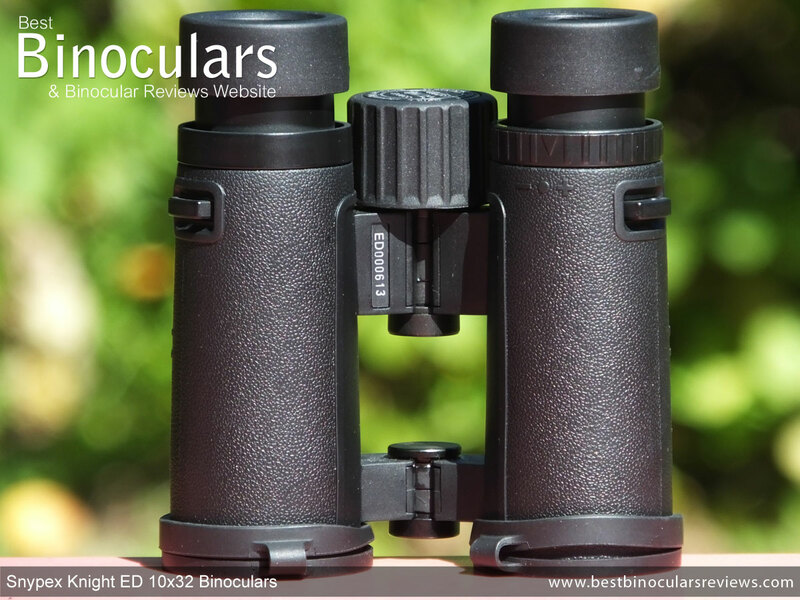 I have emphasized "good quality" because you will sometimes find that very lightweight binoculars are also made from cheaper materials like plastic. As we have already discussed, Snypex have used magnesium and aluminium to make the main body and it's components from, which along with the cutout open body design helps to keep the overall weight down. Along with the saving in weight, one of the main reasons for opting for a mid sized bin over a full sized one is to have a smaller more portable instrument. As you can see from the photo below, the 10x32 Snypex Knight ED is not only much lighter, but quite a lot smaller than the 42mm version. Once again if you compare their stated dimensions to that of other mid sized bins in the table above they are fairly standard in most respects, but perhaps with a lower profile (height) than most. Their stated width of 4.64in (11.8cm) is achieved whilst the hinges are fully open, closing them this reduced it to 10.5cm. Likewise their height of 4cm (which I measured as 4.4cm) is whilst the hinges are fully open, closing them increases this to 6.5cm. You can adjust the distance between the two ocular lenses to match that of your eyes by opening and closing the central hinges. This Inter-Pupillary Distance adjustment goes from a maximum of 7.5cm with the hinges fully opened, to a minimum 5.8cm with it closed. This is a reasonably wide range and so these should accommodate almost everyone, including those with closer set eyes like young adults or older children. Make no mistake the quality of the optical components and their coatings is excellent, but please also take a moment to read the optics section of the 8x42 Knight ED Review here, where I go over each of these in great detail. At a distance of 1000yds, these 10x binoculars produce an image that is 288ft wide (96m wide at 1000m), or to put it another way, they have a 5.5° angle of view. As you can see from the table below this is a little narrower than that on many other mid sized bins with 9x or 10x magnifications that I have tested. Whilst it is not terrible, if a wide FOV is really important to you, you may wish to opt to lower the magnification a little and go for the 8x32 Knight ED, which produces a view that is 351ft wide at 1000 yards away. Snypex state that you can focus on an object at only 3.9ft (1.2m) away, whilst I measured the minimum close focus on my test pair to be 4.2ft (1.3m). But whatever the case, this is still extremely close - I rate anything under 6ft as being excellent! So whilst these may not be the best pair of bins for scanning over wide areas, they are great for getting fantastic close up views of things like butterflies, other insects and flowers. 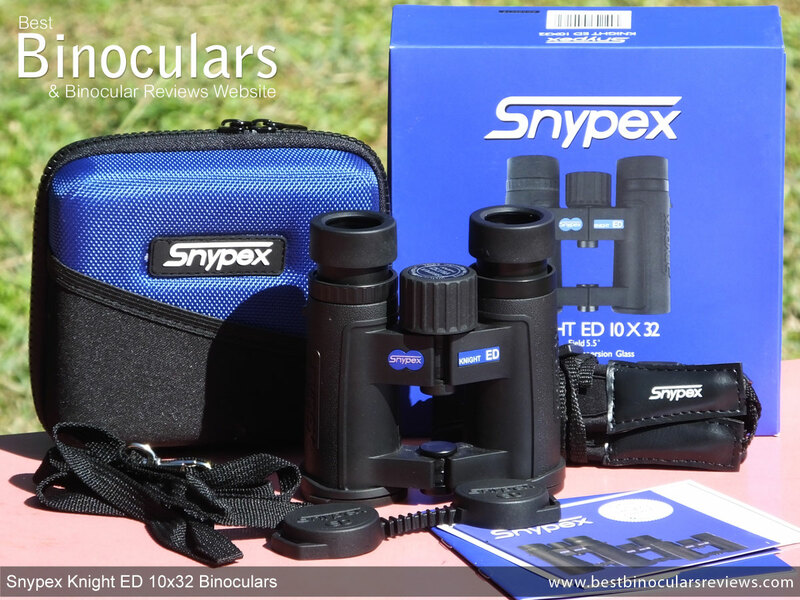 The 17.5mm of eye-relief is also excellent for a mid sized bin and they even make it onto my list of long eye-relief binoculars, which is something that you should keep in mind if you are en eyeglass wearer. 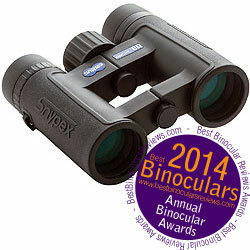 Once again and just like the other Snypex binoculars I have tested, I thought that the image produced is bright, but without being washed out and the colors are nice and vivid, but without looking too artificial. I also could not notice any artificial tinting either. Comparing them to my mid-level 10x32's there was no real noticeable difference in brightness during the day in well lit conditions. However at sunset and just after, I did think that these Snypex bins had the edge. As the configurations of the two were both the same, this difference is down to the better quality glass and coatings on the Knight ED. Overall in both good and bad light, I thought that the image was nice and bight and rate them as very good to excellent in their size class. 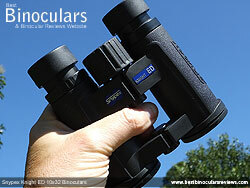 10x32 binoculars produce an exit pupil of about 3.2mm in diameter (32÷10). If you compare this to a full sized 10x42 bin that produces a larger 4.2mm exit pupil or an 8x42 with it's 5.25 exit pupil and you understand how the exit pupil and image brightness are connected, you can see that these may not be the binocular of choice for poor lighting conditions, but it does not mean they are terrible. That is the theory, which in real world conditions also played out as I could notice that the Snypex 8x42 Knight ED was indeed a little brighter in bad light. However in good light when your eyes pupils are small and assuming all other factors are equal, the image produced by this 10x32 looked just as bright as the 8x42 to me and I really could not notice a difference. Even though this image is nice and bright, you still get a good amount of contrast between the dark and light shades and not a washed out image that I sometimes observe. This is great as this contrast really helps make objects stand out and look more three dimensional. 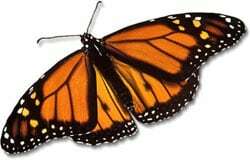 Sometimes if you look very carefully around the edges of an object you will see a colored halo (often red or blue). This is known as color fringing and is often most obvious when the object you are looking at contrasts with the background. Color fringing is caused by chromatic aberrations, which is basically because all the wavelengths of light that are split up as they go through the optical system are not returned to the exact same phase. The amount of color fringing that I could detect on these Snypex 10x32 Knight ED binoculars was very minimal and only really noticeable when you are actually looking for it, so is really not an issue at all. Whilst it was present, the degree of fuzziness or image softening right at the edge of the view on these Snypex 10x50 binoculars was minimal and nothing to worry about. Other than being smaller, the design and make up of the semirigid carry case is the same as that used on the other Knight ED models, thus you can read all the details about it on the Accessories section of the 8x42 Knight ED Review here. As well as the case, the bins come with a well made neck strap, objective and ocular lens covers, instructions and a lens cleaning cloth. Once again these are all very similar to those that are included with the other Knight ED models. So instead of just repeating myself, you can read about them in this section of the 8x42 Knight ED review here. 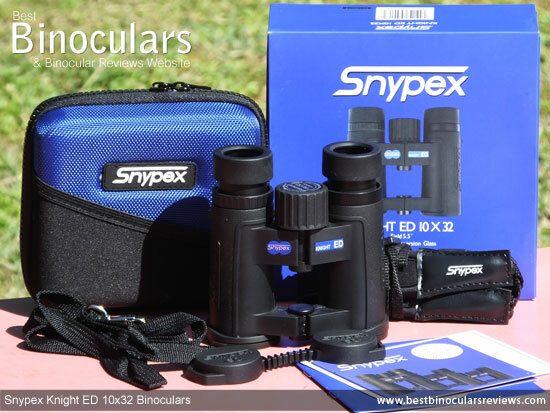 As with all Snypex Knight ED Binoculars, you get a 5 year limited warranty, full details, as well as a registration card is included within the box. Strong Points: Their low weight is chart topping, which for any mid sized bin that you want to be as portable as possible is important. Sure you can get some lighter mid sized bins out there, but most will be made from plastic and none with this quality of components. Both the close focus distance and the amount of eye-relief on these is fantastic as is the quality and brightness of image when compared to others in this size category. 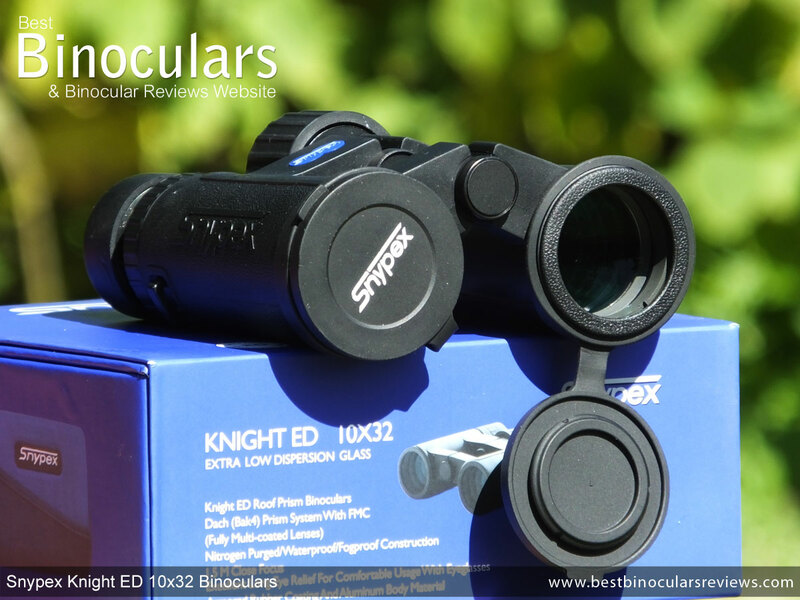 As with all other Snypex Knight ED's the build quality is better than many in this price range and they come with almost every top tier optical component and coating that you could wish for, which obviously play a major part in them producing such a good quality view. I really like the carry case, that not only sets them apart from the rest, but because of it's semi-rigid structure, does a excellent job of protecting the optics inside. Weak points? Their field of view, compared to the best mid sized bins with 9x or 10x magnifications is a little narrow, which will definitely be something to keep in mind if this is important to you. If it is, you may wish to opt for the 8x32 Knight ED instead. Having silver coated prisms is very good, but just occasionally you do find even better Dielectric coated ones within this price bracket. 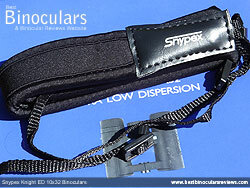 As I mentioned in my other Snypex reviews, because the rest of the body, eye-piece housings and diopter ring is made from metal, it is a little bit of a shame not to see that they completely followed it though with a metal focus wheel. For these small and lightweight bins, the neck strap is more than adequate, however in terms of class, they just don't quite match the other accessories like the carry case. 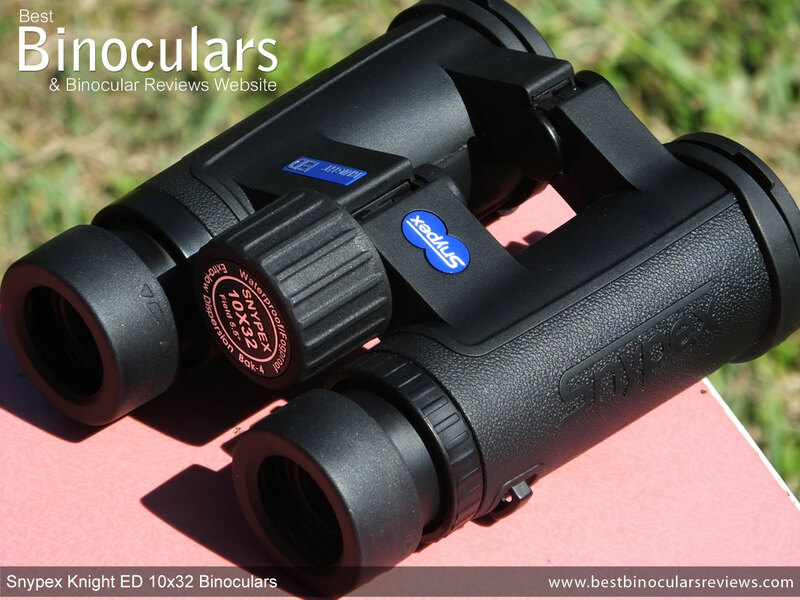 Overall - At under $500, you do get a really good quality binocular, that matches many far more expensive ones in almost every area. It is for that reason that I do believe that these are a good buy and good value for money. 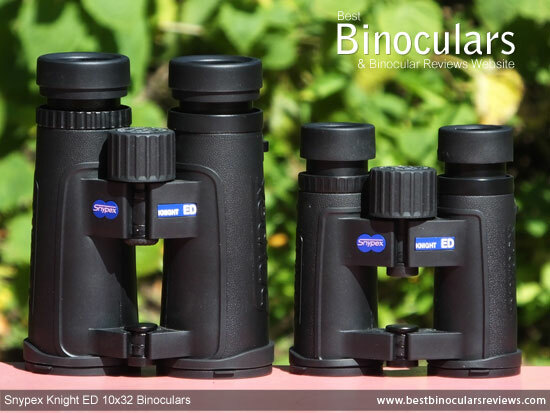 Their dimensions and weight also lead them to be a good choice to take along to sporting events, although you may prefer the wider FOV on the 8x32 model, or perhaps go for a full compact if low light performance is less important than a very small size. 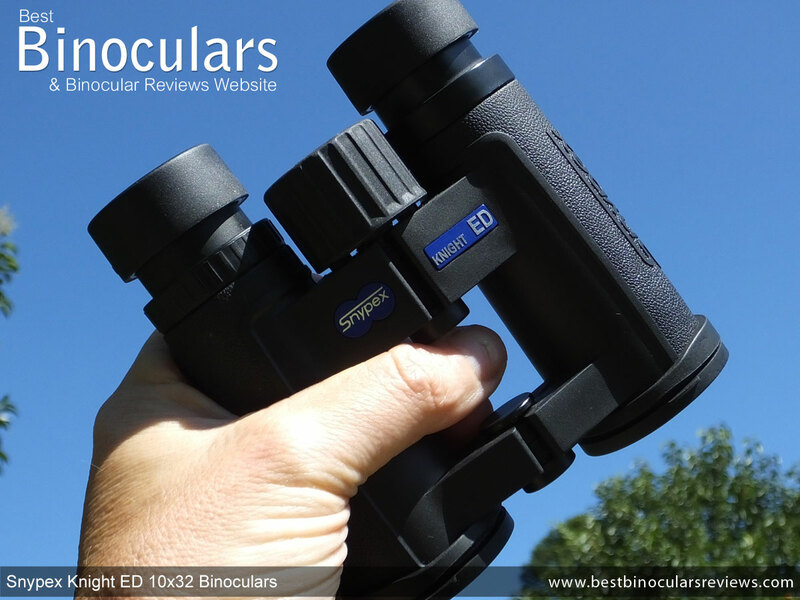 This review of the Snypex Knight ED 10x32 Binoculars and my opinions expressed about them is completely my own and I have not been compensated or persuaded to write in a particular way, which is indeed the case with all the others on BBR. I also believe all the facts and figures to be correct, but occasionally I do make an error or two. If you spot one, please feel free to contact me to let me know so that it can be corrected.